I have three cards of Mike Barlow. This one is from 1981 Topps. Playing career: Mike Barlow pitched for the Cardinals, Astros, Angels and Blue Jays from 1975 to 1981, going 10-6 with six saves and a 4.63 ERA in 133 games. A fuller account of his career can be found at the 1980Topps Blog. Where he is now: Last year he retired as the Athletic Director at Bishop Grimes High School in Syracuse, NY. Google Autocomplete results: He is second when you type Mike Barl, between Mike Bartlett, a playwright, and Mike Barletta, a Commander in the San Diego Sheriff’s Department. Another prominent Mike Barlow is a sculptor. Coming up next: The next profile will be Ricky Barlow. I have one card of Jeff Barkley, from 1986 Topps. Playing career: Jeff Barkley pitched in 24 games for the Indians in 1984 and 1985, going 0-3 with one save and a 5.40 ERA. Where he is now: The owner of the Barkley Baseball School in North Carolina, he is a Realtor at RealEdge Properties in Charlotte. Google Autocomplete results: He is sixth when you type Jeff Bark, between Jeff Barkan Subaru, who works at Subaru of Smithtown on Long Island, and Jeff Barklage, a cinematographer. Another prominent Jeff Barkley is a bodybuilder in California. Coming up next: The next profile will be Mike Barlow. I have one card of Andy Barkett, from 1993 Topps Traded. Playing career: Outfielder Andy Barkett played in seventeen games for the Pirates in 2001, hitting .304 with 1 HR and 3 RBI. Where he is now: Manager of the Marlins’ AA club in Jacksonville, he is the Director of the Baseball Pros Academy. Google Autocomplete results: He is second when you type Andy Bark, between Andy Barker PI, a television show, and Andy Barclay, the name of the original character to receive the Chucky doll in the Child’s Play movies. Another prominent Andy Barkett is an infrastructure engineer at Facebook. Coming up next: The next profile will be Jeff Barkley. 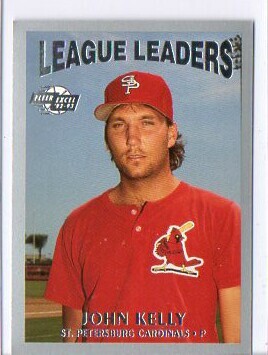 I have one card of Tim Barker, from 1991 Line Drive. Playing career: Infielder Tim Barker played in the Dodgers, Expos, Brewers, Yankees and Rockies organizations from 1989 to 1998, stealing 221 bases in 967 games. Where he is now: As of 2009 he was Branch Manager and Loan Officer at The Bank of Delmarva. He is also a youth baseball instructor in Maryland. Google Autocomplete Results: Tim Barker is third when you type Tim Bark, between Tim Barker Columbia, a writer for the Columbia Spectator, and Tim Barksdale, a birdwatcher. There are no references to the baseball player Tim Barker in the first page of Google results. Coming up next: The next profile will be Andy Barkett. I have one card of Richie Barker, from 1999 Fleer Tradition Update. Playing career: Richie Barker pitched in five games for the 1999 Cubs. In five innings, he allowed four runs on six hits, striking out three and walking four. Where he is now: He does some youth baseball coaching, but his primary job is as a Keller Williams realtor in Arizona. My memories: A couple of years ago I emailed him about his baseball card experiences, but he replied that he had no stories and nothing to share. Google Autocomplete results: He is eighth when you type Richie Bar, between Richie Barker, Manager, an English football manager, and Richie Barnett Barberton, a recently deceased auto-worker who lived in Barberton, OH. Coming up next: The next profile will be Tim Barker. I have 21 cards of Len Barker. This one is from 1979 Topps. Playing career: Len Barker pitched eleven years in the major leagues. His best seasons were in Cleveland, leading the American League in strikeouts in 1980 and 1981. He pitched a perfect game for the Indians in 1981. He was traded to the Braves during the 1983 season, but injuries limited his effectiveness for Atlanta. A fuller account of his career can be found at the 1980 Topps blog. Where he is now: Head baseball coach at Notre Dame College. He also participates in fantasy camps. In the 1990s, he met a fantasy camper named Mike Ferrante. They ended up going into the construction business together for a while, and Barker married Ferrante’s daughter. My memories: He is from before my time. The MLB Network showed a replay of his perfect game a while back – it was fun watching a game from 1981. Google Autocomplete results: He is second when you type Len Bar, between Len Barry, a singer, and Len Barot, an author. Another prominent Len Barker is Category Director at Asda Stores. Coming up next: The next profile will be Richie Barker. Mark Teixeria, right before he became a Yankee. Great shot of Carlos Lee, who announced his retirement last week. I have five cards of Kevin Barker. This one is from 2001 Topps. Playing career: First baseman Kevin Barker played sixteen seasons of professional baseball, reaching the major leagues with the Brewers in 1999 and 2000, the Padres in 2002, the Blue Jays in 2006, and the Reds in 2009. In 126 games he hit .249 with 6 HR and 36 RBI. Where he is now: He retired last year, shortly after marrying former MLB network anchor Hazel Mae. Google Autocomplete results: He is first when you type Kevin Bark, ahead of Kevin Barker Film Editor, a motion picture editor. Coming up next: The next profile will be Len Barker. I have one card of Jeff Bailey, from 2009 Topps. Playing career: First baseman-outfielder Jeff Bailey played fifteen seasons of professional baseball. He reached the major leagues for parts of three seasons with Boston, hitting .228 with 6 HR and 16 RBI in 56 games. Where he is now: Anyone know where Jeff Bailey is now? Google Autocomplete results: Jeff Bailey Red Sox is ninth when you type Jeff Bail, between Jeff Bailey MMA, a fighter, and Jeff Bailey Out of the Past, referring to Robert Mitchum’s character in a 1947 movie. The first entry when you google Jeff Bailey is not the ballplayer but an art gallery owner. Coming up next: The next profile will be Kevin Barker. 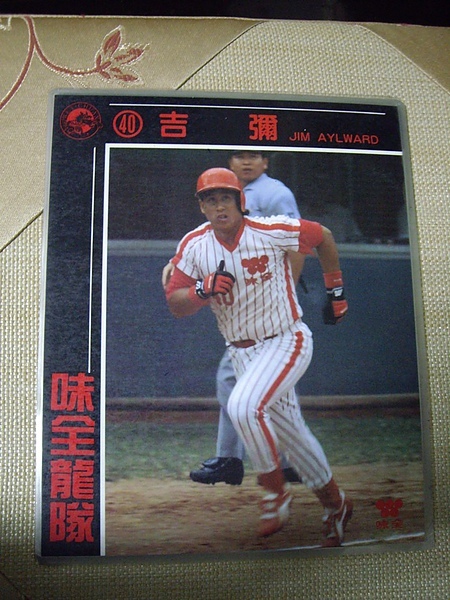 Infielder Jim Aylward played four seasons in the Angels organization. His best season was 1989, when he hit .293 with 11 HR and 77 RBI for Quad Cities. He later played professionally in Taiwan for the Wei Chuan Dragons. Now a Personal and Commercial Lines Account Executive at Palomino Insurance, he kindly answered my questions about baseball cards. "I did play a couple of years in Taipei, Taiwan and an interesting story about baseball cards. The league was just in its second year and professional baseball was a big hit there (no pun intended). I was fortunate to have made the all star team both years and while I was at a gigantic mall one day, I went up to the sporting goods section to check out some things, and there on the wall is a Christmas card with my name and photo on it. Inside the card was wishing someone a Merry Christmas and also it had a mini card inside as well. It was a pretty cool setup, but never saw any of that licensing monies! I also am a collector of cards, memorabilia. My favorite item is a signed Spalding bat of the original hall of fame class….the likes of Babe Ruth, Ty Cobb, Honus Wagner, Tris Speaker, Cy Young, etc. There is one missing hall of famer obviously not signed was Christy Mathewson, who died in 1925, and the first hall ceremony was in 1939. The story behind the bat was that a longtime resident went to the hall of fame game and had gotten everyone’s signatures, plus Mel Ott, who was either a player or a coach of one of the playing teams that day. It is a very cool bat and even looks “old”, and the signatures are obviously wearing away. The signatures are also in green ink…….I found out that Ty Cobb did lots of his signing with green ink!" I have one card of Glen Barker, from 1999 Skybox Premium. Playing career: Outfielder Glen Barker played ten seasons of professional baseball, making the major leagues for parts of three seasons with the Astros. In 235 major league games, he hit .232 with 3 HR, 18 RB and 30 SB. In the minor leagues he stole at least 20 bases five times. Where he is now: Minor league baserunning coordinator for the Padres. Google Autocomplete results: He is fourth when you type Glen Bar, between Glen Barrentine, former Chief Regulatory Officer of the American Stock Exchange, and Glen Barry, a forest conservation expert. Another prominent Glen Barker is a Health Science Professor at Diablo Valley College. I have one card of Greg Bargar, from 1984 Topps. Playing career: Greg Bargar pitched for the Expos and Cardinals from 1983 to 1986, going 2-3 with a 6.34 ERA in 33 games. Where he is now: A sheriff in the Pima County, AZ Police Department. Google Autocomplete results: He is second when you type Greg Barg, between Greg Barger, a banker at NewSpring Capital, and Greg Barge, an account executive at Plan B Technologies. There do not appear to be any other prominent Greg Bargars. Coming up next: The next profile will be Glen Barker. I have ten cards of Josh Barfield. This one is from 2007 Topps Opening Day. Playing career: Second baseman Josh Barfield played for the Padres and Indians from 2006 to 2009, hitting .264 with 16 HR and 112 RBI in 309 games. Where he is now: This year, he is playing for the independent Long Island Ducks, hitting .333 with 1 HR and 9 RBI in 22 games. My memories: I remember him coming up with some hype, and being the son of a former Yankee, I rooted for him to do well, but he flamed out pretty quickly. Interesting facts: Son of former Yankee Jesse Barfield, and brother of A’s minor leaguer Jeremy Barfield. Google Autocomplete results: He is third when you type Josh Bar, between Josh Barro and Josh Barro bio, which refer to a political writer. There do not appear to be any other prominent Josh Barfields. Coming up next: The next profile will be Greg Bargar. I have two cards of Pat Bangtson. This one is from 1991 Line Drive. Playing career: Pat Bangtson pitched five seasons in the Twins organization, going 55-36 with a 3.86 ERA. 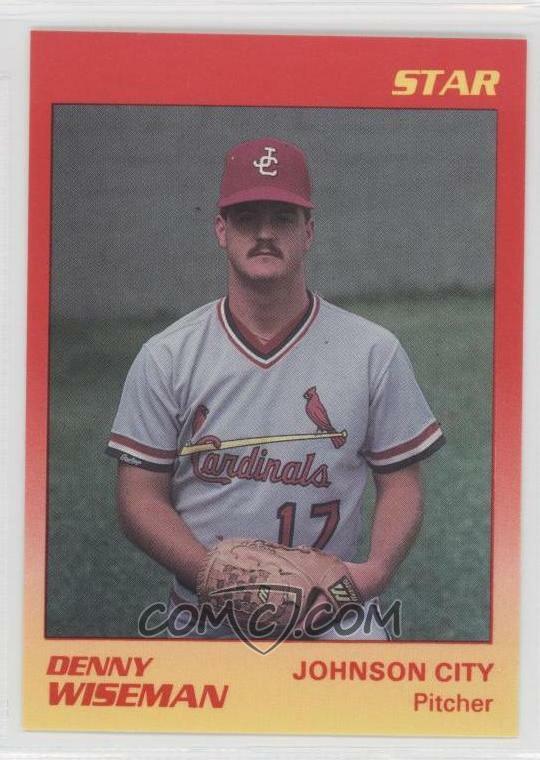 His best season was 1988, when he went 17-5 with a 2.87 ERA for Kenosha. A fuller account of his career can be found at The Greatest 21 Days. Where he is now: After over a decade of coaching college baseball, he now works in insurance. Google Autocomplete results: He is tenth when you type Pat Bang, behind Pat Bange Appraisal, an Oregon real estate appraiser. There do not appear to be any other prominent Pat Bangtsons. Coming up next: The next profile will be Josh Barfield. I have one card of Doyle Balthazar, from 1991 Line Drive. Playing career: Catcher Doyle Balthazar played eight seasons of professional baseball, mostly in the Tigers organization. In 489 games he hit .258 with 15 HR and 148 RBI. Where he is now: Anyone know where Doyle Balthazar is now? Google Autocomplete results: He is second when you type Doyle Bal, between Doyle Bale Buggy, a haybale mover, and Doyle Baldante, a freight shipping company in Melville, NY. There does not appear to be any other prominent Doyle Balthazars. Coming up next: The next profile will be Pat Bangtson. I have one card of Shon Ashley, from 1991 Line Drive. Playing career: Outfielder Shon Ron Ashley (his real full name) played in the Brewers organization from 1985 to 1991. In 1991 he had a phenomenal season at AA El Paso, hitting .308 with 24 HR and 100 RBI. However, he was let go by the Brewers after the season, and after 58 games at AAA Indianapolis in the Expos organization in 1992, he quit, something he vowed todo for his wife if it became clear he had no shot at the major leagues. Where is he now: Owns Ashley Glass in Idaho. Google Autocomplete results: He is first when you type Shon As, ahead of Sean Astin, the star of Goonies and Rudy. There do not appear to be any other prominent Shon Ashleys. Coming up next: The next profile will be Doyle Balthazar. I have one card of Fernando Arguelles, from 1991 Line Drive. Playing career: Catcher Fernando Arguelles played four seasons in the Pirates and Mariners organizations. In 214 games he hit .218 with 3 HR and 59 RBI. Where he is now: Sales Consultant at Zoll Medical in Miami. Google Autocomplete results: He is first when you type Fernando Arg, ahead of Fernando Arguello, a State Farm agent. The first entry when you google Fernando Arguelles is not the ballplayer but a director of photography. Coming up next: The next profile will be Shon Ashley. I have one card of Jorge Alvarez, from 1991 Line Drive. Playing career: Jorge Alvarez had an extraordinary playing career in professional baseball. Between 1988 and 2010 he was a regular for either an affiliated or an independent-league team. In 2010, as a 41-year-old, he hit .319 with 4 HR and 44 RBI in 61 games for Shreveport-Bossier of the American Association. Where he is now: A hitting instructor at Elite BaseballAcademy in San Antonio. Google Autocomplete results: He is fifth when you type Jorge Al, between Jorge Almiron, an Argentine soccer player, and Jorge Alessandri, the 27th President of Chile. The first entry when you google Jorge Alvarez is not the ballplayer but the co-founder of Advizr. Coming up next: The next profile will be Fernando Arguelles. Dennis Wiseman pitched five seasons in the Cardinals organization. His best season was 1990, when he went 13-6 with a 2.66 ERA for Springfield and St. Petersburg. Now the Chief Operating Officer of Radiology Associates of South Florida, he kindly answered my questions about baseball cards. "I used to collect cards but gave them all to my brothers.... as I did with autographed balls, bats, jerseys. I never really thought of such things until I was done with the game. 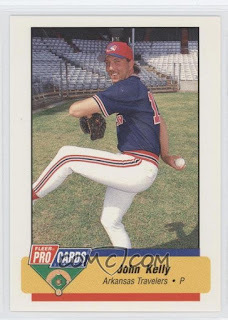 My favorite baseball card is my Johnson City card because it was my first baseball card. I couldn't believe all the hard work through the years actually came to reality. Seeing my picture on a card solidified that I was a "pro". Double A (Arkansas Travelers) was strange both years because two different card companies came in for the photo shoots." I have one card of Clemente Acosta, from 1991 Line Drive. Playing career: Clemente Acosta pitched seven seasons in the Pirates and Angels organizations. In 181 games he went 22-30 with 16 saves and a 4.44 ERA. A fuller account of his career can be found at The Greatest 21Days. Where he is now: Anyone know where Clemente Acosta is now? Google Autocomplete results: He is first when you type Clemente Ac, ahead of Clemente Achievement Academy High School, a Chicago school named after Roberto Clemente. Another prominent Clemente Acosta is a marketing consultant. Coming up next: The next profile will be Jorge Alvarez. 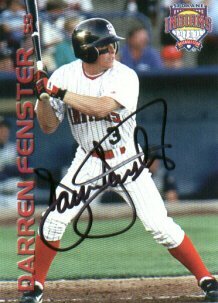 Infielder Darren Fenster played five seasons in the Royals organization, hitting .267 with 5 HR and 179 RBI in 458 games. Now the manager of the Gulf Coast Red Sox and writer of the youth baseball instruction blog Coaching Your Kids, he kindly answered my questions about baseball cards. "Back in the day, shortly after my cousin gave me my first set, a 1987 Topps collection in a binder, divided up team by team, I became an avid card collector. Initially for those first couple years, my older brother and I would buy wax boxes of different brands, and put them together in a binder just as our cousin had done previously. When the 1989 Upper Deck set came out, we became enamored with card value, and went from organizing them into a sleeve for a binder, to keeping them in their original box to keep them in the best condition. We'd go to card shows every couple months along the Jersey Shore, and loved getting what we thought was a great deal on a rare series of cards (like Donruss Studio or Topps Stadium). Our collection died down as soon as we got into high school (right around 1993-94), but for a solid six years, we were really into the baseball card "scene". What's neat now, while currently working for the Red Sox and having played and coached in the game for the past 13 years, is coming across guys as colleagues and opposing coaches/instructors whose cards I still have to this day. 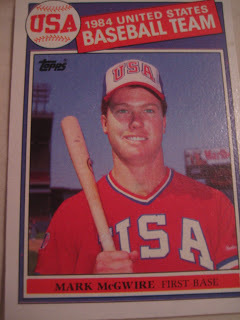 A couple individual cards that still stick out in my mind are the 1984 Topps Mark McGwire Olympic card, and the Bo Jackson 1989 Score card with the bat over his shoulders in football pads. 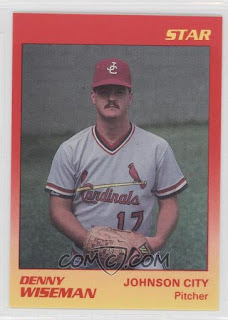 The McGwire card was a big deal because it was so rare. The Jackson card was just cool, and unlike any other- I think the back of it only said "BO" in big letters. Personally, I absolutely love the first card ever made for me, which from 2000 with the Spokane Indians. 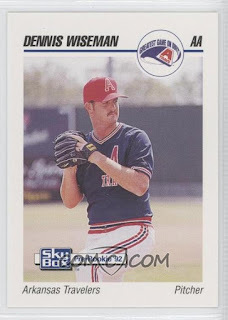 I am not sure if it's my favorite because it was my first card, or because it's a picture I really like or what... but it was taken prior to my very first professional AB. I know this because it was the only game I wore eye black, and I hit a triple in my first at bat, and slid into third which obviously made my uniform dirty. Having such a huge moment caught on a card was and still is a pretty big deal to me. My other favorite personal card is a Topps Heritage card from 2005. I really like the throwback design, not to mention the card having two photos on it. Being that I did collect cards as a kid, it was very surreal to learn that Topps made a card of me- a friend emailed me the day they went on sale in the winter of 2005. I'm not sure if they still do this, but soon after signing with the Royals, Topps offered every professional player a $5.00 contact which basically allowed them permission to use your likeness in a card or promotion. No one ever cashed the check, because it was for five bucks, and more a novelty coming from the original card company in Topps. Once they did actually make a card of me, I had a check for $1500 waiting for me in the clubhouse... apparently that was part of the deal. Needless to say that was a pretty cool surprise." John Kelly pitched five seasons in the Cardinals organization, going 14-17 with 124 saves and a 2.68 ERA. Now a special education teacher and baseball coach at Lanier High School in Georgia, he kindly answered my questions about baseball cards. "I have a good story for you. I believe it was for 1 of my Arkansas Travelers cards, the photographer was telling everybody to smile for the pictures and every one of course replied I am not posing and smiling for a baseball card . . . check mine out I overly emphasized the smile and the pose! When we got the cards back mine was the talk of the clubhouse! My favorite card was the League Leader card. It is obvious why." Outfielder Chris Wakeland played eight seasons of professional baseball. He made the major leagues in 2001 with the Tigers, hitting .250 with 2 HR and 6 RBI in 10 games. Now the Managing Coach for the Huntington Beach Toros in California, he kindly answered my questions about baseball cards. "I was on a card with two guys - Jason Conti and player named Brian Cole who was a big Mets prospect who died in a car accident after spring training. I collected cards growing up and stopped in 1992. My favorite card is an Upper Deck Ken Griffey Jr rookie card. Also the Rickey Henderson Topps rookie card. What's so cool is I got to play against both of those guys in my career! My wife currently has every baseball card I have been on and has over a hundred of them and is constantly on eBay battling people for them. My wife's favorite card of me is my Jacksonville Suns AA card." Thanks! Unfortunately I couldn't find a picture of the Jacksonville card. Catcher Jose Fernandez played six seasons in the Cardinals and Phillies organizations, including parts of three seasons at the AAA level. After his baseball career he went into education, earning a doctorate degree from the University of Central Florida. Now the Athletic Director at Woodward Academy in College Park, Georgia, he kindly answered my questions about baseball cards. "You never knew when the card companies would show up to take pictures so you never really had an opportunity to prepare for them. I remember the picture I took for the AA Arkansas team, the photographer showed up right before our practice and our manager almost didn't let the photo op happen. I guess the picture from the AA Arkansas team is the one most people have asked me to sign for them so it must be the favorite. I do not collect baseball cards, I collect Native American pottery instead." 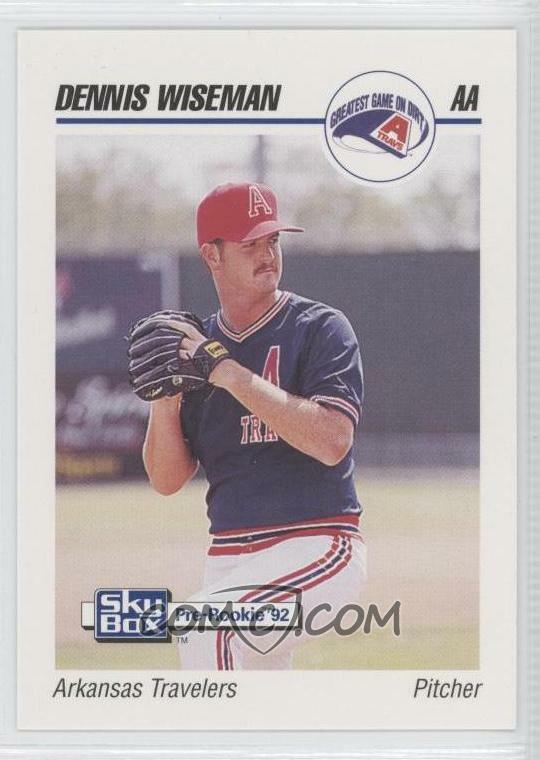 I have one card of Mike Anderson, from 1991 Line Drive. Playing career: Mike Anderson pitched in three games for the 1993 Reds. In five innings he allowed eleven earned runs. Interesting facts: He is the brother of Brewers announcer Brian Anderson. Where he is now: Anyone know where Mike Anderson is now? Google Autocomplete results: Mike Anderson is first when you type Mike Ande, ahead of Mike Anderson Arkansas, a basketball coach. Another prominent Mike Anderson played for the Phillies in the 1970s. I have eleven cards of John Barfield. This one is from 1991 Score. Playing career: John Barfield pitched for the Rangers from 1989 to 1991, going 8-8 with 2 saves and a 4.72 ERA in 65 games. Where he is now: Anyone know where John Barfield is now? Google Autocomplete results: He is first when you type John Barf, ahead of John Barford, a Uranian poet. Another prominent John Barfield is the former chairman of the Bartech Group. I have one card of Josh Alley, from 2006 Grandstand. Playing career: Outfielder Josh Alley played five seasons in the Padres organization. In 331 games he hit .264 with 9 HR and 109 RBI. Interesting stories: After a high school game in 2002, he was on the field shaking hands with opponents when a brawl broke out, and Alley was sucker-punched, having his jaw broken. Where he is now: Anyone know where Josh Alley is now? Google Autocomplete results: He is ninth when you type Josh Alle, between Josh Allen Football, a high school star in football, and Josh Allen Blizzard, referring to a World of Warcraft expert hired by the video game company. Another prominent Josh Alley is a web engineer. Coming up next: The next profile will be John Barfield. I have 65 cards of Jesse Barfield. This one is from 1992 Stadium Club. Playing career: Outfielder Jesse Barfield played twelve seasons for the Blue Jays and Yankees. He hit .256 with 241 HR and 716 RBI. The American League home run leader in 1986 (with 40), he was a two-time gold glove winner known for having one of the best throwing arms in baseball history. 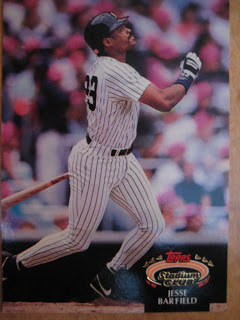 My memories: He was one of the best players on those bad Yankee teams of the early 90’s. He was fun to watch because there was always the chance of a home run. I was sad when his career ended abruptly in 1992 with a broken leg. Where he is now: Hitting instructor at Competitive Edge Sports Center in Spring, TX. Interesting facts: Son Josh Barfield has played in the major leagues, and son Jeremy Barfield is in the A’s minor league system. Google Autocomplete results: He is sixth when you type Jesse B, between Jesse Benton, campaign manager for Rand Paul, and Jesse Borrego, an actor. There do not appear to be any other prominent Jesse Barfields. I have one card of Jon Adkins, from 2005 Fleer Tradition. Playing career: Jon Adkins pitched six seasons in the major leagues for the White Sox, Padres, Mets and Reds. His best season was 2006, when he went 2-1 with a 3.98 ERA for San Diego. Where he is now: A scout for the Red Sox. Interesting facts: His brother, Tim Adkins, pitched thirteen seasons of pro baseball. Google Autocomplete results: He is tenth when you type Jon Ad, after Jon Adwar, who works at JP Morgan Chase. Another prominent Jon Adkins is a photographer.